Delta Schedules & Puts First Airbus A220 On Sale! Delta has locked in the date for the first service of their new A220 aircraft. Originally scheduled for January 31st, Delta was forced to delay the launch of this new aircraft in their fleet. This was due to the FAA being shut down by the US government resulting in Delta unable to receive certification for their new aircraft type. When is the new launch date? Delta has initially penciled in February 7th as the launch date of the A220. The new aircraft will be leaving Delta’s hub airport in New York, LaGuardia (LGA), and will be traveling to Boston (BOS) as well as Fort Worth (DFW). They currently have four A220-100’s in their fleet, and will be assigning two aircraft to each route. Tickets are currently on sale on the Delta website (here is the link) but availability is running out fast. The first flight of the A220 leaves at 6:00 AM, New York to Boston. The very first flight to Boston has already sold out first class, however, there are four flights a day (round trip) so if you are very keen to fly onboard on the 7th, you can sleep in and fly on the 2nd flight. New York to Fort Worth, plenty of first-class availability if you are willing to pay for it. For those that have their tickets, what can you expect when flying on the Delta A220-100? 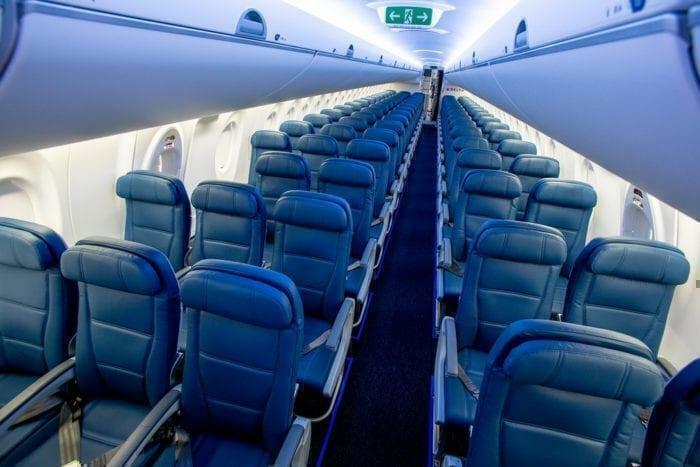 On board the jet, there are 82 economy seats with a seat pitch of 31 inches (and a width of 18.6 inches, the largest in the industry) which is far more generous than the 28 inches we expect on other carriers. 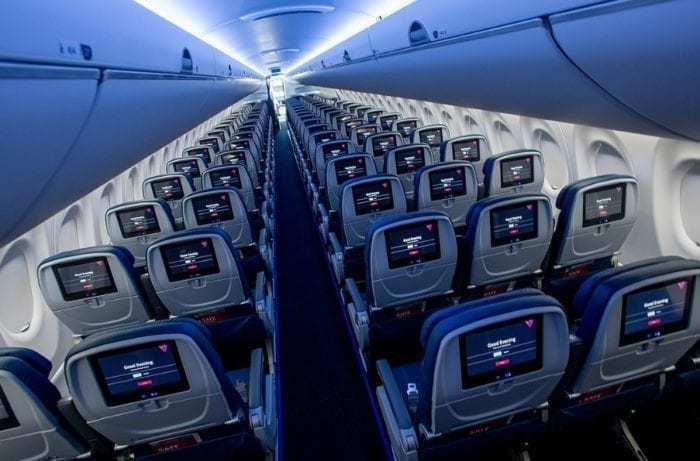 There is also 15 Delta Comfort+ seats on board (34 inches seat pitch). All seats come with access to WiFi and seat back entertainment screens. The windows are also bigger (with a window in the bathrooms as well!) and the plane is quieter (although this has the con that you can hear other people talking much clear). Flights to Texas will include a meal in Delta Comfort+ and First Class, with food available to purchase for economy. No word if the Delta soft product is different on the A220, but we shall soon know. Delta intends to have 90 A220’s in their fleet by 2023 (40 A220-100’s and 50 larger A220-300’s) with deliveries of the A220-300 beginning by 2020. Will you be buying a ticket to fly on the first Delta A220 flight to Boston? I had a seat on a A220 on a flight back from Boston to New York, but, alas, it was not meant to be. I am now on a Boeing 717. Maybe my chances for an upgrade have improved. I see a flight at 7:05am on Delta’s website (flight # 715) leaving DFW headed to LGA. I’m hoping to get on that flight and hoping for a fun celebration for it’s first flight! On Delta’s website, I saw a flight from DFW to LGA on 2/7 at 7:05am (Flight # 715). I’m hoping to get on that flight and that there will be an inaugural celebration for it! Who is the manufacturer for the seating?